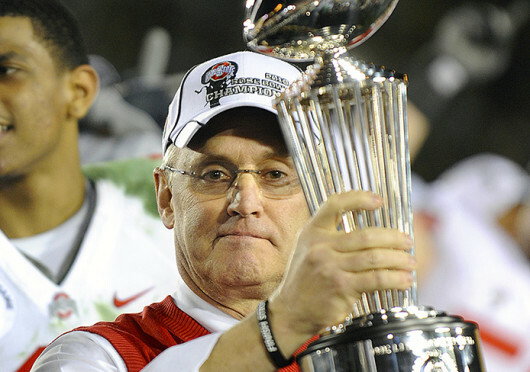 Then-OSU coach Jim Tressel holds the championship trophy after a game against Oregon Jan. 1, 2010, at the Rose Bowl. OSU won, 26-17. Since its first season in 1890 when it finished 1-3, the Ohio State football team has finished with an undefeated record 10 times. Of those 10 seasons, only four resulted in the Buckeyes being named national champions. This season, it is quite possible that more than two teams will finish undefeated in the Football Bowl Subdivision. That means an undefeated Buckeye team, that currently sits at No. 4 in the BCS standings, will likely find itself on the outside looking in when it comes to the BCS National Championship Game. If that happens, and OSU wins the Big Ten, they will take part in “the granddaddy of them all,” the Rose Bowl. In years past, this level of competition would lead to an argument that the NCAA must adopt a playoff system, but they already have. While that system will not be in effect this season, the Buckeyes might just be better off with a trip to the Rose Bowl. Anyone who follows OSU even semi-closely remembers the last two times the Buckeyes had a shot at the crystal football. I have to remind you: One of those teams finished the regular season with an unblemished record, and the other lost once and stumbled into the game. Both times, the Buckeyes were simply dominated in the final, first by a score of 41-14 against Florida in the 2006-07 season, before losing to the Tigers from LSU, 38-24, the next year. If an OSU fan were to argue that those results are preferable to a Rose Bowl victory, I would honestly not believe them. The Rose Bowl is one of the most significant games in the history of college football. While it may not play a role in deciding the champion, as it once did, the game holds incredible value to this day. Take a look at the 2007 season, for instance. OSU started the year ranked No. 11 in the AP poll, before finding itself in the top spot by mid-October. The Buckeyes then dropped a shocker at home to eventual Rose Bowl runners-up Illinois Nov. 10, 2007, and found themselves, at the time, out of the BCS National Championship picture. Were it not for chaos at the top of the polls in the final weeks of the season as every team ranked ahead of OSU lost, the Buckeyes would have been on their way to Pasadena instead of New Orleans. The smell of roses was in the air, and nobody could have been happier. This is the Big Ten. This is OSU. While it might not crown a team the champion, the Rose Bowl still holds value in the hearts of many Buckeye fans. The 2013 Buckeyes are favored to finish the year without a loss, even though there are four more games before the Big Ten Championship Game. Obviously, every college football player, coach and fan hopes for his or her team to win the national championship, but I’m here to tell you that the world will not end if OSU is held out. A Rose Bowl win would taste just as sweet, and certainly sweeter than a loss to Alabama. Urban would slap you if you said this to his face… Woody is rolling over in his grave. How is this even allowed to be run?? Yes Tim, we all want to go to Pasadena, but on January 6th, not the 1st! Your article seems defeatist! Alabama plays LSU this week. The only way Lou Miles can redeem his season is to beat Alabama, so expect a great game. And if Alabama survives they then must play Auburn the next week.. a team ranked higher than LSU even after losing to them. Oregon plays Stanford this week, at Stanford. And the next week they play Utah… a team that upset Stanford. So there is a small but distinct possibility that the Ducks could get upset by one of those teams. Finally, there is Florida State! Averaging 56 points per game and, if they get by undefeated Miami this week, the Seminoles are my dark horse pick to play in the National Championship. Let’s hope it is versus the Bucks! What does 2006 or 2007 have to do with 2013? Just because OSU lost those, you can’t be scared to go back to the title game. So we should all be content with a Rose Bowl? It’s that mindset that turned the B1G into the chicken sh*t conference it is today! Looks like Gary beat me to the punch here, but I couldn’t agree more. Failing to recognize the big picture nationally, setting the bar low and being satisfied with backyard conference titles and Rose Bowls is what has turned this once proud conference into the disaster it is today. This isn’t the 1960s. The Rose Bowl should be thought of as an unfortunate consolation and never the end goal. The author sounds like one of those old timers who talk about the good ol’ days when we didn’t care about stuff like national championships and also yell at you to sit down and be quiet when you have the nerve to stand and cheer for a 70-yard touchdown run. From my perspective after being born and raised two blocks from the OSU campus, sold Saturday Dispatch papers at the entrance of the Horseshoe for $0.10 each, and watched Archie Griffin earn his Heisman, I look at any post season games as nothing more than practice games for next year’s Michigan game. Some of you are delusional- you act as playing in the Rose Bowl will be the same as playing in the Papa John’s Pizza Bowl. This is the ROSE BOWL for crying out loud- were none of you around in 2010 when a Buckeyes team doubted on every level against a superior Oregon team, went to Pasadena and did what most Big 10 teams can’t do..and won? That was a HUGE statement game and playing against a team like Stanford or even a one loss SEC team (should Oregon go to the NCG) would be a giant statement to people who say the SOS is weak. Everything else aside, we want to be able to pitch tradition and a longs standing program, rich in history to recruits. Winning the Rose Bowl let’s us do that- especially when it is the 100th Rose Bowl. We will be in the spotlight game on New Years’ Day, as recruits party with their friends and watch TV- we can prove so much in the Rose Bowl. Sure, the NCG is where every team wants to be, but some of you need to place a little more value in what the Rose Bowl is and what it has done for the image of Ohio State football. I agree with the writer, not with the delusional fanatics. If the Buckeyes end up still in 3rd or 4th place I’ll be very happy for them to play in the Rose Bowl, where they will likely have their hands full facing Stanford or even Oregon. It will be the 100th Rose Bowl and that makes it even more special. If the Buckeyes are meant to play in the title game then they will. At this point, they are not quite there yet. One awesome game against a shaky PSU doesn’t mean they are ready to handle Alabama or even Oregon’s powerful offense. Plenty more games to be played in any case. Yep, there’s that segment of the fan base that was bound to show up eventually. I don’t think anybody here is trying to say the Rose Bowl isn’t a top tier bowl and a decent enough accomplishment. It’s certainly better than fielding a miserable 6-6 team and going to the Gator. If things don’t work out and OSU ends up in the Rose Bowl, fine, whatever, it could be worse. Where I think we take exception is with the idea that’s far too prevalent in the fan base that the Rose Bowl is THE goal for the season. Alabama fans didn’t come into this season saying they’d be okay with just winning the conference and playing in the Sugar Bowl. Can we not carry ourselves like a fan base of a team that started the season ranked #2 and expected to contend for a title? The B1G is the only place where such a large segment of the fans are content to play in a glorified exhibition game rather than for a championship because that’s how it was 50 years ago. It shows on the field. Maybe if others around the conference would set the bar a little higher, we’d have some competition and not be on the outside looking in right now. You guys are also probably the same ones who get upset when OSU signs 5-star athletes from all over the country now instead of offering that spot to a 2-star kid because his uncle played at OSU in 1946 and he grew up wanting to be a Buckeye. What I am not OK with is OSU going undefeated 2 years straight and fans being content with STILL not being able to battle for a title. Do I think OSU is the top team in the country? No. But I also am not gonna let ESPN tell me that OSU has an NAIA schedule while Bama, FSU, and Oregon when you really look at it arent that much tougher, could all win the AFC East. The Rose Bowl is fine. It’s a good solid bowl. Lighten up guys, it’s just football….